Kunstler has a habit of speculation about the future with at best, partial information. But on this subject, he is spot on! 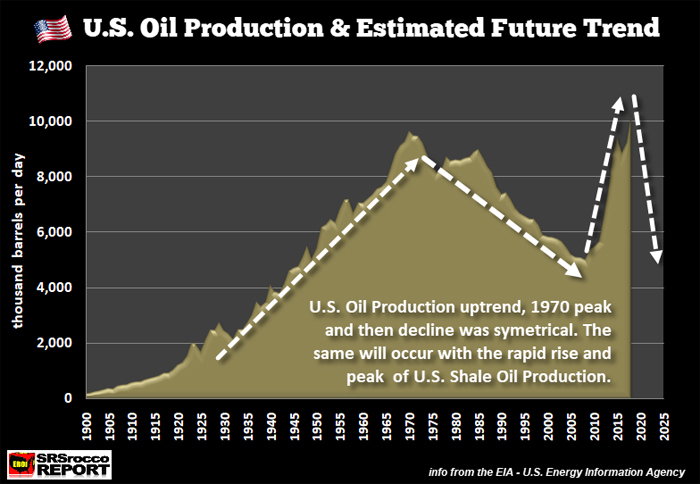 Shale oil is a mirage. It is a secondary recover scheme that only works when there is plenty of money financing this crazy difficult / expensive scheme. In many cases, shale exploration does not even cover the investment in purely energy terms so eventually, even the hot money boys will find something else to do. Of course, none of this is especially new. I knew folks in 1960s oil patch North Dakota who could have predicted that the long-term outcome for such scheme was non-producing wells. Enjoy Kunstler at his most informative. In June of 2008, US crude hit $144-a-barrel, a figure so harsh that it crippled economic activity � since just about everything we do depends on oil for making, enabling, and transporting stuff. The price and supply of oil became so problematic after the year 2000 that the US had to desperately engineer a work-around to keep this hyper-complex society operating. The �solution� was debt. If you can�t afford to run your society, then try borrowing from the future to keep your mojo working. The discovery of new oil had been heading down remorselessly for decades, to the point that the world was fatally short of replacing the oil it used every year with new supply. The last significant big fields � Alaska, the North Sea, and Siberia � had been discovered in the 1960s and we knew for sure that the first two were well past their peaks in the early 2000s. By 2005, most of the theoretically producible new oil was in places that were difficult and ultra-expensive to drill in: deep water, for instance, where you need a giant platform costing hundreds of millions of dollars, not to mention armies of highly skilled (highly paid) technicians, plus helicopters to service the rigs. The financial risk (for instance, of drilling a �dry hole�) was matched by the environmental risk of a blowout, which is exactly what happened to BP�s 2010 Deepwater Horizon platform in the Gulf of Mexico, with clean-up costs estimated at $61 billion. Technology � that El Dorado of the Mind � rode to the rescue with horizontal drilling and fracturing of �tight� oil-bearing shale rock. It was tight because of low permeability, meaning the oil didn�t flow through it the way it flowed through normal oil-bearing rocks like sandstone. You had to sink a pipe down, angle it horizontally into a strata of shale only a few meters thick, and then blast it apart with water under pressure and particles of sand or ceramic called propants, the job of which was to hold open those fractures so the oil could be sucked out. Well, it worked. The only problem was you couldn�t make any money doing it. The shale oil companies could get plenty of cash-flow going, but it all went to servicing their bonds or other �innovative� financing schemes, and for many of the companies the cash flow wasn�t even covering those costs. It cost at least six million dollars for each shale well, and it was in the nature of shale oil that the wells depleted so quickly that after Year Three they were pretty much done. But it was something to do, at least, if you were an oil company � an alternative to 1) doing no business at all, or 2) getting into some other line-of-work, like making yoga pants or gluten-free cupcakes. The two original big shale plays, the Bakken in North Dakota and the Eagle Ford in south Texas, have now apparently peaked and the baton has passed to the Permian Basin in west Texas. If the first two bonanzas were characteristic of shale, we can look forward not very far into the future when the Permian also craps out. There are only so many �sweet spots� in these plays.